SMOKTech is well known for their reliable lineup of products and the SMOK T-Priv 3 Kit with TFV12 Prince Tank stands out with its superior engineering and high performance capacity. The T-Priv 3 Box Mod features a robust chassis with an elliptical shape that’s free of any hard edges, providing an exceptionally comfortable grip no matter how you choose to hold it. SMOK manufactured the T-Priv 3 with the industries latest technological advancements to deliver an intuitive device that offers long-lasting power. Constructed out of a durable and high-quality Zinc alloy, the SMOK T-Priv 3 measures 86mm x 57.23mm x 47mm and is powered by three external high-drain 18650 batteries (batteries not included). Similar to the original T-Priv design, SMOK includes a large OLED display that’s located at the top-face of the mod, providing easy-to-read vaping data next to the mods Stainless threaded 510 connection. When the device powered on, the screen displays the current wattage, voltage, resistance, ramp-up setting, and three individual battery life indicators. The SMOK T-Priv 3 is a Temperature Control device that provides accurate TC vaping with Nickel, Titanium, and Stainless Steel heating elements between 200 and 600°F (100-315°C). What’s more, the powerful 3-battery functionality of the T-Priv 3 offers up to 300W of unprecedented vaping power in Variable Wattage mode (that’s 80W more than the original T-Priv). To give your mod an extra touch of personality, SMOK includes 9 customizable LED color modes: red, green, blue, yellow, magenta, cyan, RGB, and rainbow. This 258g device is outfitted with all of SMOK’s staple safety features to give the T-Priv 3 the SMOK safety seal of approval, such as: intelligent atomizer recognition, puff monitoring system, 10s cutoff, short-circuit protection, over-heating protection, and low-battery warning. If SMOK releases any User-Interface/firmware updates in the future, the T-Priv 3 is equipped with a Micro-USB port that can be used to upgrade the device firmware. Increasing the overall ergonomics of the device and staying true to the original T-Priv design, the T-Priv 3 features a long vertical firing-bar that stretches from top to bottom along the side of the mod. This intuitive firing mechanism allows the user to hold and fire the device comfortably in virtually limitless handheld positions. Alongside the T-Priv 3 is SMOK’s revolutionary TFV12 Prince Sub-Ohm Tank a massive power-driven sub-ohm tank that’s got some serious e-liquid storing capacity as well as high-wattage potential. The TFV12 Prince is one of SMOK’s larger tanks, constructed out of high-quality Stainless Steel and heat-resistant Pyrex glass measuring 63mm tall and 25mm in diameter. With its massive 8mL e-juice capacity, the convex bubble-shape of the Pyrex glass reservoir extends out from the chassis of the tank, creating a bulge that measures 28mm in diameter. 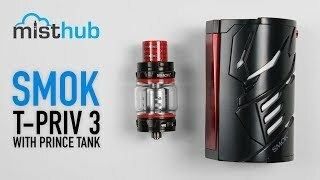 Like all of SMOK’s tanks on the Taste Furious platform, the TFV12 Prince Sub-Ohm Tank is equipped with SMOK’s patented “high-and-lock” leakproof top-filling design that makes filling the tank fast and painless. To fill the tank, simply press the button that’s located just beneath the drip tip on the top cap. With the button depressed, the hinge function unlocks, and the cap can be twisted open with a simple counter-clockwise twist of the top cap. What really makes the TFV12 Prince stand out among the Cloud Beast King and its older Taste Furious brethren is the included Wild Cobra Delrin Drip Tip. For the first time in SMOK’s entire history, they’ve replaced the boring black Delrin drip tip with a distinguished Snake Skin pattern that’s quite unlike anything we’ve ever seen from SMOK before. Along the bottom of the tanks Stainless Steel framework is a free-spinning adjustable airflow control ring that provides complete control over two large airflow channels. These airflow channels can be easily opened and closed to deliver the perfect airflow experience, no matter which style of vape you prefer. Mouth-to-lung vapers and Direct-to-lung vapers will both rejoice knowing that the TFV12 Prince has an airflow setting that is perfect for their specific vaping style. Arriving pre-installed inside the tank is SMOK’s mid-range 0.4 ohm V12 Prince-Q4 Quadruple Coil atomizer head that’s been rated between 40-100W. This multi-faceted atomizer head has been tested extensively and is suggested for best use between 60-80W to get SMOK’s trademark “deep and rich” flavor. Also included with the TFV12 Prince is the heavy-hitting 0.12 ohm V12 Prince-T10 Decuple Coil atomizer head. As you probably guessed it, the T10 Decuple coil is outfitted with 10 high-wattage coils that have been tested and rated for use between 60-120W. If you’re looking to get the absolute most cloud production out of the T10 Decuple atomizer head, SMOK suggests choosing a wattage between 80-110W and letting the clouds rip. Both of the included atomizer heads are constructed out of Stainless Steel and are wicked with Pure Organic Cotton to deliver SMOK’s unparalleled flavor experience. Since SMOK’s V12 atomizer heads are equipped with Kanthal wire heating elements, these coils should only be used in Variable Wattage mode and NOT Temperature Control. The SMOK T-Priv 3 Kit with TFV12 Prince Sub-Ohm Tank has a regal appearance that displays nobility and class, making it a worthy delicacy to add to your collection of all day vapes.